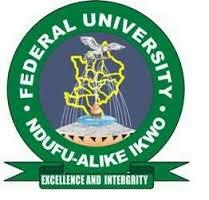 Federal University Ndufu-Alike Ikwo (FUNAI) , Ebonyi State Adjusted First and Second Semester Academic Calendar for 2018/2019 Academic Session. The Federal University Ndufu-Alike Ikwo (FUNAI) , Ebonyi State 2018/2019 adjusted academic session academic calendar is out. FUNAI 2018/2019 academic calendar has been adjusted by the senate after the suspension of the 3months old ASUU Strike.